1. To begin the entry process, visit http://www.reggieawards.org. 2. To create a new account, click on the link in the left corner that says "Click here to get started." 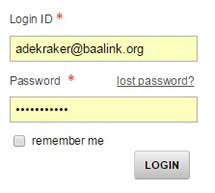 If you already have an account, login with your Login ID and password in the fields located on the left side of your screen. If you entered the REGGIE Awards last year, you most likely already have an account. If you forget your password, simply click on the "lost password?" link and follow the instructions to reset your password. 3. If you are creating a new account, you will be prompted to enter your email address (which will be your Login ID) and some additional information required to create your account. 4. 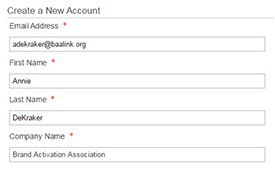 Once you have created an account or have successfully logged-in, you will be automatically directed to a link that says "Click here to begin a new Submission" or you are able to create a new entry by clicking on the "Submit" button on the green menu bar. 5. 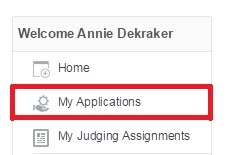 You may manage and edit existing applications or entries by clicking on the button labeled "My Applications" at any time. 6. To complete your submission, you must fill out each form associated with the application. The forms require your information, the information of the brand who worked on the campaign, the information of the agency if applicable, answers to the case study questions, and at least one artwork upload. You can advance to each form by clicking "Save and Next" at the bottom of the screen and return to a previous form by using the bread crumb trail on the top of each page. 7. Once you have finalized all of your information and answers, you must accept the terms and conditions on the Artwork page and click on the "Submit" button. 8. You will see one item added to your cart. 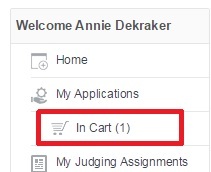 Your cart can be accessed by clicking on the button on the left side of your screen labeled "In Cart." 9. In your cart, you can copy your submission if you are planning to enter the same campaign into more than one category by clicking on the "Copy Submission" link on the right. Remember to adapt your entry to the requirements of the category you are entering. You may also make edits to your entry or remove it from your cart. Once you are ready to finalize and submit your entry, click on the gray "Check Out" button on the bottom of the screen to access the payment page. 10. You may choose to pay by credit card or check. Choose your method of payment and fill out the required information. NOTE: Credit card payment is preferred so your entry can be immediately entered into the awards. If you choose to pay by check, your payment must be received no later than March 1, 2019 in order for your submission to be advanced to the judging rounds. If payment is not received before or on that date, your submission will not be included in the competition. 11. After you have filled out the required payment information, click "Process" to submit your payment. Once your payment has been processed, you will have officially entered the 2019 REGGIE Awards! NOTE: After your payment is processed, you will no longer be able to make changes to your submission. If you need to update information before the final deadline, contact Annie DeKraker at adekraker@ana.net or (646) 708-8127. If you need assistance or have any additional questions about entering the 2018 REGGIE Awards, please contact Annie DeKraker at adekraker@ana.net or 646-708-8127.